Sometimes, a bad call can really be a momentum-killer. Such was the case for the Boston Celtics in Game Four of the Eastern Conference Finals, when Marcus Morris was called for an offensive foul on a trey that could have been a four-point play just as Boston closed in on erasing a very large lead thrown up in the first quarter by the Cleveland Cavaliers. Now mind that the Celts should never have been down like that in the first place, so you'll be hearing no tin foil hat ref conspiracies here, though I will say the game was poorly called on both sides (that out of bounds in the final minutes was also one of the more egregious screw-ups I've seen, but whatever). 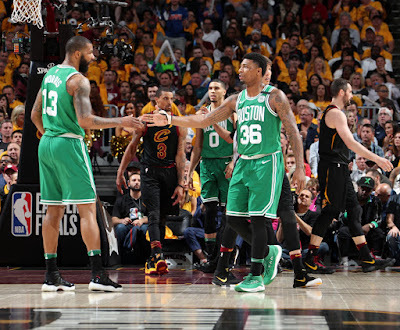 The Celtics could and should have done a better job falling so far behind in the first place that I will reserve my ire for their lack of team play that led to it. But I'm not going to ignore how dumb of a move this was to call a foul on a play that was clearly Mook drifting backwards after liftoff and trying to use his leg as a counterweight so he doesn't land on his back. Well, first of all, it was his right leg that extended here, not the left. But watch any Marcus Morris jumper, he takes them all the same way. I know Max and I drive people crazy defending the officials, but here, there was no intent. You can see Kevin Love aggressively close out from an angle that, if it had been less acute, could have (and arguably still should have) gone the way not as a simple illegal contact foul, but a technical or even flagrant aggressive closeout foul the league has given referees the latitude to call. Love's leg hooks into Morris', creating the exact type of situation such a call was greenlighted to address. It's in the past, and the team, Morris, and coach Brad Stevens had little to say about the officiating, likely for financial reasons as much as focusing on the things they control. But it's worth reviewing, if not for outcome-shifting potential as much as player safety. If this is an offensive foul, how does one separate it from the Bruce Bowen- type of closeout the league is trying to diminish? Let us know your thoughts on the play, and how you think it should be called in situations like this one in the comments below.